Just like the day one heard that John Lennon had been murdered, the news that Prince has left us fills me with huge sadness mixed with anger, confusion, a feeling of mortality, and to not tolerate pettiness from idiots and to kick all those who have offended me in the nuts- all those ingrates, all those little people with their peanut brains and infantile politics- Lennon’s Nowhere Man multiplied many times over and making all their nowhere plans for nobody. Losing Bowie this year was hard to take, but it wasn’t that much of a surprise. He hadn’t been well for some time and was busy preparing his last goodbye. Prince was 57, and one kept thinking he was forty or at least in his Forties. He was going to be making music for another thirty or forty years. Last week in Melbourne, I was in a pub sharing his performance at a George Harrison Tribute Concert with two good friends. On YouTube, it can be found under The Greatest Guitar Solo In The World. While a band comprising Jeff Lynne, Steve Winwood, Tom Petty and others perform a respectable version of “While My Guitar Gently Weeps”, and there’s a respectful guitar solo, nothing prepares us for what Prince, standing quietly all the while, does when he steps forward and unleashes a guitar solo that has it ALL. He blows those polite white boys off the stage by shredding, riffing, channeling Hendrix and making his guitar weep, cry, howl and scream. It’s an extraordinary performance of arrogance, confidence and creativity, and the biggest dose of humility one can take when thinking you know it all and can do it all when it comes to music. The little Purple One from Paisley Park makes everything seem so insignificant. Prince transcended making music by fighting for his music and taking on a giant music company like Warner Music. To get out of his recording contract, he released music under a symbol. 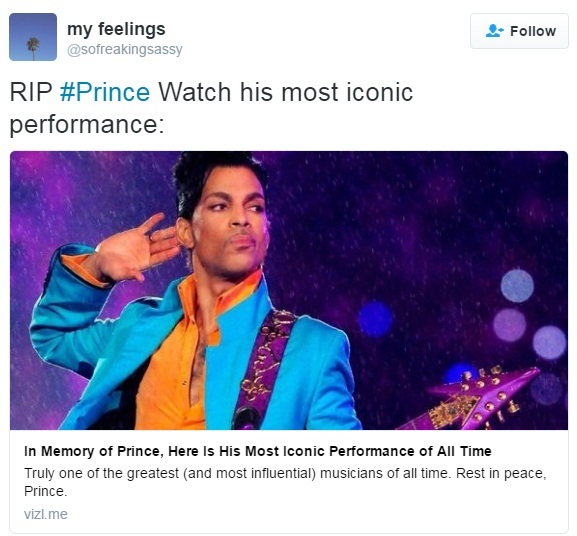 Prince became a symbol for years. 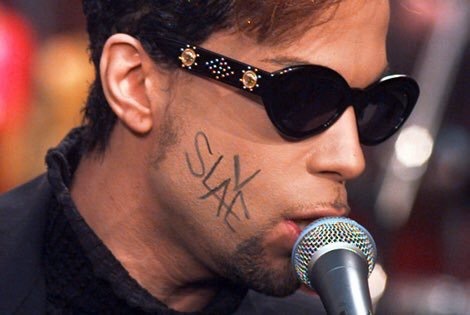 He wrote the word “Slave” on his cheek- a slave of Warner Music. After leaving Warner, he had the smarts to make direct deals with concert promoters: Make the costs of the concert tickets slightly higher to include his latest record. It pissed off his new label- Sony Music- but Prince didn’t care. He was taking charge of his art- and on a global scale. James Brown, Jacky Wilson, Stevie Wonder, the hugely underrated Sly Stone, George Clinton and Michael Jackson all advance what is called “black music”. Add Earth, Wind and Fire to that list and Parliament. 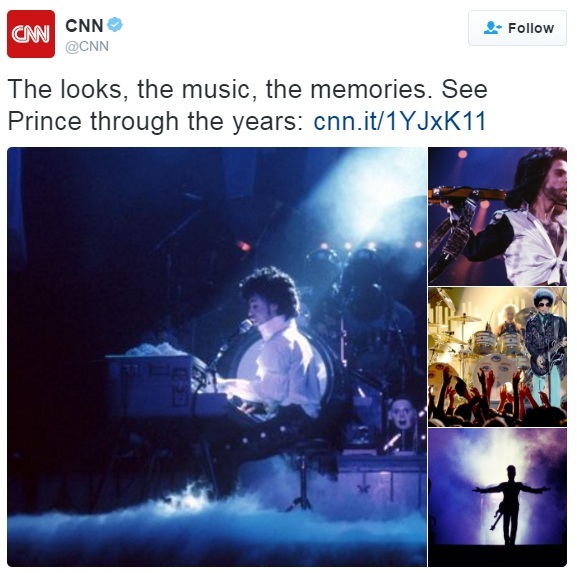 But Prince was much more as he did it all- wrote everything, often played every instrument on every recording, made impromptu appearances at small clubs and played for hours for free to a handful of people. Prince was his own man with an amazing body of work. What a catalogue and musical legacy he’s left behind- all his various periods- and not that different to the ways in which Bowie kept evolving. 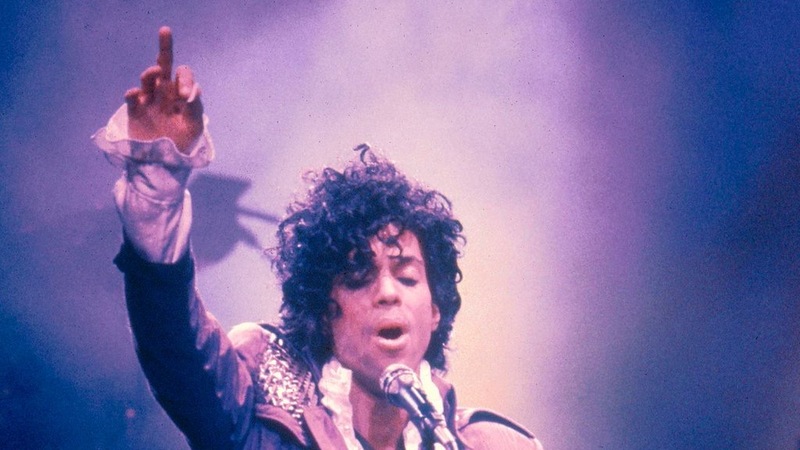 “1999″, “Kiss”, “Strawberry Beret”, writing “Manic Monday”, Nothing Compares To U”, “The Most Beautiful Girl In The World”, the Batman soundtrack, “When Doves Cry”, “Purple Rain” and so much more, this was and is Prince. Here’s hoping that he and Bowie are partying like it’s 1999. We’re the ones missing out. We’re the ones stuck here in mediocrity and, way too often, wasting time and energy on mediocre people.